What this means in detail: There are one hundred and fifty fuel cell hybrid buses in use in 20 cities around the world. But these buses are mostly prototypes. Still, by Ballard’s own account, the trial runs helped the company to acquire the industry’s most extensive expertise over the past 25 years. The buses ran up more than 8 million kilometers and transported over 10 million passengers. They are driven under very different circumstances at each location (road and weather conditions, H2 infrastructure, etc. ), geographically or climate-wise, especially when in daily use. 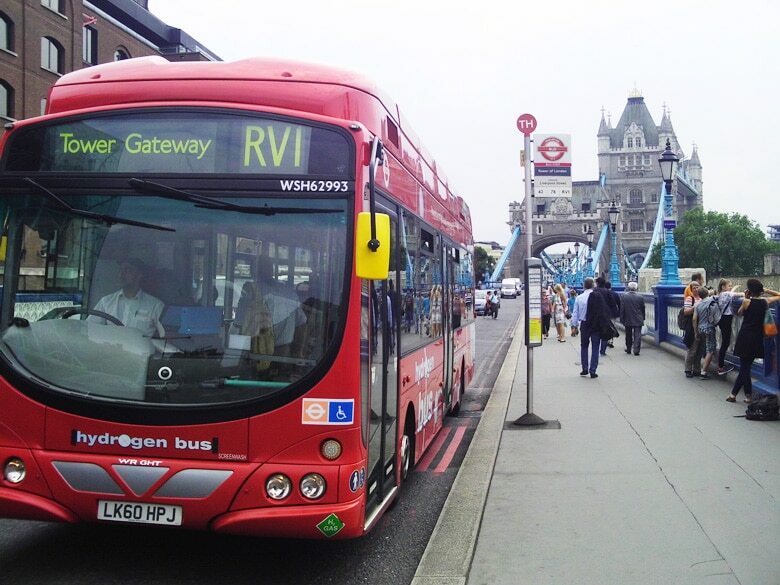 London boasts eight buses with 20,000 hours in operation. Extremely rare downtimes make for high reliability. The market now offers the seventh generation of fuel cell stacks for buses. Their price tumbled by 65% over the past six years and is said to decrease by another 30%. Five hundred to a thousand fuel cell buses are planned to gain traction on Europe’s roads between 2017 and 2020, which sounds like a big number but seems negligible compared to the potential for the technology in China. Ballard received USD 48 million in firm orders in 2015. The company has already been contracted to manufacture 300 buses. I expect the first contracts for railway vehicles to be signed this year – after test runs and prototypes. If one’s estimate is based on the envisioned fuel cell production of 12,000 units per year, Ballard can look forward to tremendous growth rates and will now end the time for trial runs in favor of large-scale market deployment. China has announced the general outline of the thirteenth Five-Year Plan: Especially the transportation infrastructure and measures to combat pollution – primarily, air pollution – take priority. In the future, authorities will be required to have 50% of their vehicle fleet equipped with electric engines, which includes fuel cell technology. There are plans to purchase 5,000 electric vehicles and 5,000 buses with hybrid technology. By 2020, there are supposed to be five million electric vehicles on the road. They, too, will make use of fuel cell technology. An extraordinary opportunity. Ballard also does work for Volkswagen, which bought patents and purchases additional engineering services from the Canadian enterprise. Audi is VW’s main driver of developments in electric transportation. It’s interesting to hear members of Ballard’s board of directors saying that the company had expertise and intellectual property in fuel cell technology which would be relevant and crucial to the entire automotive industry. To me, this means Ballard holds key patents. In other words: There won’t be a way around Ballard for the global car industry, which gives me hope that the company will be able to generate license revenue in the future. Another interesting fact is that the milestones agreed upon with VW were not only achieved but exceeded – a better-than-expected performance. As Ballard put it: “We believe that our team produces the world’s best automotive fuel cell stack and we even developed new proprietary technology to strengthen Ballard’s position in competing with the automotive industry.” – My thought: Things couldn’t be better. Almost 10,000 forklift trucks – most of them equipped with Ballard’s fuel cell stacks – have already been sold on the market via Plug Power. Ballard sees opportunities here to do business with other forklift truck manufacturers as well. Hyster-Yale, too, is gaining a foothold in the industry through its acquisition of fuel cell producer Nuvera Fuelcells. Plug, however, has meanwhile began to install its own fuel cell stacks (ReliOn), which will lead to an eventual drop in the number of orders for Ballard. Still: This segment is said to be not that profitable, so that an entry into fuel cell markets promising higher growth rates and better margins would make sense. I’d be curious to know, however, whether Plug isn’t using Ballard’s patents, which would generate license revenue for the company at a later date. Ballard‘s subsidiary Protonex is said to contribute USD 20 million to revenues this year. In my eyes, more important than the amount of revenue (and profits) it will create is the trust the US military has put into the company, enabling all branches to place orders with Protonex. This should pave the way for a considerable growth in orders in the future. As one of the biggest US employers, the military has come to realize the potential offered by fuel cells and hydrogen as well as their ecological benefits (see the cooperation with GM and Boeing). Conversely, the Backup Power segment seems to make few inroads, appears to be not very profitable and may simply require too much capital. There are those big growth opportunities (e.g., in India), but it seems as if Ballard may just pass up on the opportunity altogether. Either the company will sell its investments in this field, establish a joint-venture, bring its assets into another company in the industry or even trade IP – whatever the decision, it will definitely be made in 2016. Ballard is in the perfect position and is increasingly aligning its interests. Shrinking the executive board and/or replacing board members by other experienced personnel is a sign of change as much as a cut in costs. The company has already netted USD 58 million in firm orders for 2016 – more than last year’s total revenue of USD 56.5 million. China is the driver of company turnover, as it offers by far the greatest potential – despite simultaneous developments in fuel cell use in other countries and the increasing prominence fuel cells are gaining in other big important markets, such as the automotive industry. The same is true for batteries in hybrid engines, with Toyota being the frontrunner in this segment. But China offers economies of scale that, of course, will exert a positive influence on costs/prices for fuel cell stacks. And considering the around one billion vehicles in use around the world, there will be no other choice than to gradually replace fossil fuels by green hydrogen. Ballard is one of the big players in the industry – although the stock price hasn’t yet caught up with the company’s rosy outlook.